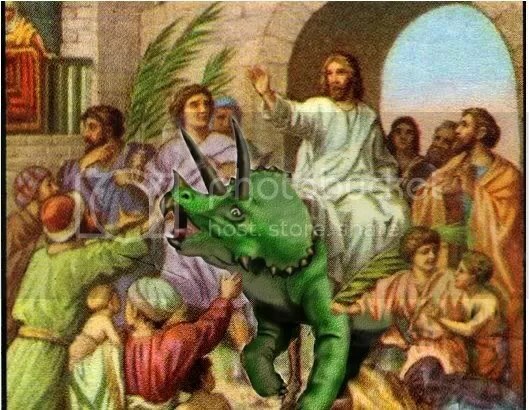 I’m not sure where in the mists of Internet history the Jesus riding the dinosaur to church thing first happened. To me it’s felt like it’s been around as long as the Westboro Baptist Haters or the crazy doomsday prophets on the street corners. That is, always. Today, however, I think the meme jumped the shark… as it were. Today, it showed up in Petsmart. Most of the images I’ve seen of Jesus riding a dinosaur are of him riding something like a T-Rex or a raptor. And, no, folks, it isn’t a Velociraptor at that size, it’s a Utah Raptor. Grumble *science* grumble *stupid Jurassic park* grumble. Anyway, there’s one image of Jesus riding a Triceratops that’s always stuck in my head. It’s a pretty good ‘shop and it looks like he’s riding it into town on Palm Sunday. Check it out. I mean, how could you not like that? The triceratops fairly leaps out of the screen at you. Rawr. I know that growing up I would have found Sunday school MUCH more interesting if these were the pictures in my Bible. But, I digress. Anyway, back to Petsmart. We popped in this evening with Dash and Thumbelina to get a bag of dachshund food. Naturally, the place is loaded with all things Halloween. There are more dog costumes than you could possibly imagine. Though, the following one stopped me dead in my tracks. Take a look. But, I’m telling you, my mind went immediately to the Jesus Rides A Dino To Church meme. Sure, the Petsmart website is very careful to call it the “Caveman Rider Costume” and all that but, come on. From the front view on their website it even looks like the “caveman’s” spear is a shepherd’s crook. See? I mean, really. Somebody at Petsmart clearly spends too much time on Reddit. Geoff is giving me the stink eye and thinks that I’m being over dramatic about this and seeing something that isn’t there. But at a store where you can buy duvets for your dog beds by Martha Stewart, and on clearance no less, I think anything is possible. I’ll tell you this much. If I were to dress either of the dogs up for Halloween in a costume like this, that “caveman” would be wearing a handmade toga like robe. I mean, the designer clearly intended it. I’m just following the vision. … at least you can’t buy a bidet for your dog?